Properties in Andover average 4.7 out of 5 stars. Property 1: 3 bedroom Andover farmhouse (west side) in the center of "nature's playground"
Property 9: Beautiful Off-the-Grid Cabin. Next to A.T. in Andover Notch. Property 10: Mountain Cottage - Lake and Mountain Views! Property 11: Off-the-Grid Easy Access Cabin to the A.T. in Andover Notch . Property 16: 3 Minutes To Ski Lifts With Fantastic Views! Property 18: Bethel Home w/ Hot Tub - Minutes to Outdoor Areas! Slopeside townhome w/ deck, mountain view & shared pool/hot tub - ski to lifts! 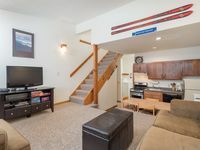 Property 22: Slopeside townhome w/ deck, mountain view & shared pool/hot tub - ski to lifts! 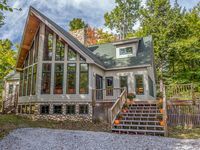 Riverfront Ski Chalet Cabin only minutes to Sunday River Resort & Trails Galore! Property 23: Riverfront Ski Chalet Cabin only minutes to Sunday River Resort & Trails Galore! Viewtop Cabin. Close to Sunday River!! Property 24: Viewtop Cabin. Close to Sunday River!! 7th Night FREE when rent for a week! Property 30: 7th Night FREE when rent for a week! Property 33: Cozy ski-in/ski-out townhouse steps from trail - walk to dining, dogs welcome! Property 47: Mountainside condo w/ ski-in/ski-out access, shared heated pool, & more! We loved the cascades condos! The balcony was perfect to see fireworks in the evening and to enjoy the spring weather during pond skim weekend. We arrived late for check-in and the alternative procedures were very simple. The condo was very clean and cozy. The location could not have been more convenient, I was recovering from ACL reconstruction surgery so the short walk to south ridge was perfect. We would absolutely rent these condos again, I would just recommend getting something on the A-level as the stairs were plentiful to the C-level. Very comfortable. Great space for our large family. The house worked out perfectly for our large family. Convenient short walk to the trail to ski down to the chairlift.